The SWIi project is funded by Durham County Council, Durham University and European Regional Development Fund to install new and advanced solid wall insulation systems on over 200 stone and brick built properties in towns and villages across County Durham. 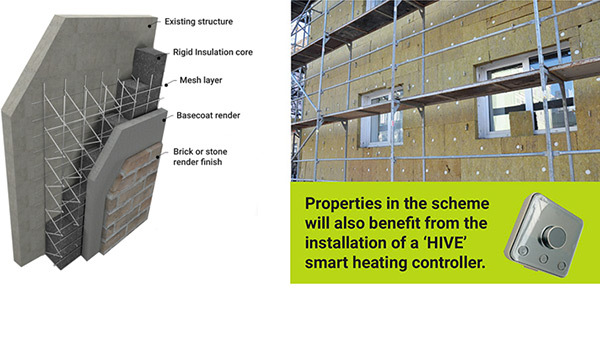 Properties in the scheme will also benefit from the installation of a ‘HIVE’ smart heating controller. Durham University Energy Institute are the project research partner and will be monitoring selected properties and households in the scheme to demonstrate the effectiveness of SWI on energy usage and energy bills. Houses over 100 years old are usually of solid brick or stone construction. In the North East most Properties built after 1920 were constructed with a cavity between the inside and outside walls. This cavity can be easily filled with insulation, usually pumped into the cavity through holes drilled into the cavity through the external wall. By contrast older solid wall properties can only be insulated by attaching insulation boards or sheets to the inside wall (this is known as internal solid wall insulation) or to the external wall (this is known as external wall insulation). Internal and external wall insulation boards must be sealed with fire retardant layers of plaster, render or sheet material. For external wall insulation the fire retardant top surface must be approved by the Council’s Planning and Building Control Departments. Why do we need to insulate homes – what are the benefits? We need to insulate our homes effectively to reduce the amount of energy we use to heat our homes. A well insulated home typically uses 25% less energy than an uninsulated similar property. This also saves householders 25% on their heating bills and is good for the environment, helping reduce global warming. External wall insulation helps prevent penetrating dampness and water ingress and provides a ‘face lift’ to older properties. A good external wall insulation installation also adds value to a property making it more desirable and attractive. The Council’s Planning Department permits a like for like surface treatment. That means if a property is of stone construction the external wall insulation rendered surface must also be stone in appearance. If the existing property is of brick construction then the surface render treatment mustalso be brick in appearance.The SWIi project aims to develop and showcase the best brick and stone finishes on the market today. Durham County Council and Durham University Energy Institute are working together to identify the benefits to and customer behaviours around smart heating controls and an innovative ‘Peer to Peer’ whole place energy advice and support system that has also been supported as part of this project. © Copyright 2018 - swiiproject.co.uk - Website Hosting and Design by Total Results Ltd.